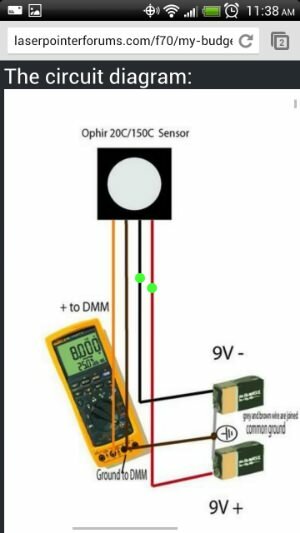 I just watched video of a member using a power sensor attached to a DMM. How does that work? Where can I find more information? LPM heads which do this use what is essentially a thermo-electric cooler module which has diode junctions sandwiched in the middle of two ceramic plates, one side thermally coupled to a heat sink, the other the side is the surface a laser beam will heat, as you shine it on the head window, or rather, aperture, usually painted dark, or with some dark substance adhered to it to help absorption across a range of wavelength. The temperature differential between the plates produces a voltage across the diodes you can measure (up to a point, once that heat sink warms up too much, the temperature difference is diminished and you will then no longer have accurate readings). Some heads have a linear relationship to millivolts, others require a conversion chart, or a circuit board which converts the mv reading to a digital value to correspond to the power. I reset my password using my iPhone to answer this post and didn't know I had my first LPF account associated with that email account from 2013 and posted this without seeing I was using my old account. Now I'm using my notebook and have emailed Avery asking him to please combine both accounts. So you and FAP are one and the same, Alaskan? Yes, we are not allowed to have two accounts, that's why I asked to combine them together, no answer yet though. When I responded, I didn't see what happened, that I had reopened an old account. I couldn't understand how "FAP" had posted what I wrote, then I saw what happened. I had completely forgot about having created that account. This is how I made mine, basically two batteries, a switch, and some plug in connectors placed in a project box. The green dots are where the switch is. Ditto, same I have too. Yes, that Ophir head needs a positive and negative rail to power the sensor. The greater the difference the higher the power it will read. Up to a point, anyway. side on that OPHIR 20C head.